Matt Stuart’s witty vision and keen sense of timing have made him one of the strongest voices in modern street photography. The iN-Public member’s work has been exhibited around the world and his first photobook is finally available for pre-order. We asked Matt a few questions about the process of making his first photobook and how it influenced his work. Hit the jump for the interview! 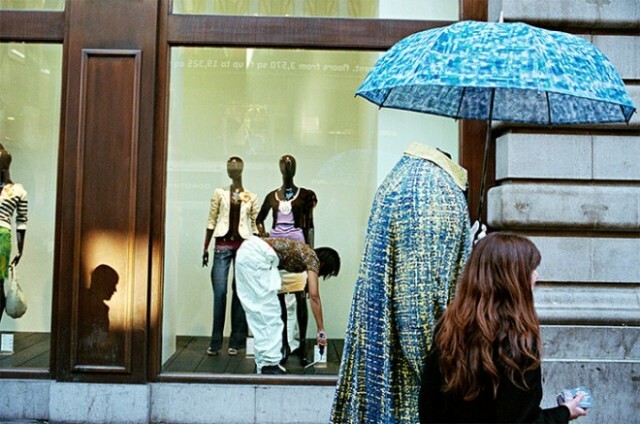 All That Life Can Afford by Matt Stuart contains street photographs taken in London between February 2002 & November 2015. There are 80 images over 160 pages and it includes an essay by Geoff Dyer. The book is available in standard and limited editions. The standard edition has a cream cover and sells for £30. The limited edition (first 100 copies) has a dark turqoise cover and comes with an archival print that’s signed and stamped by Matt. The limited edition sells for £100 which is a bargain considering prints from Matt’s recent print sale were £100 alone! 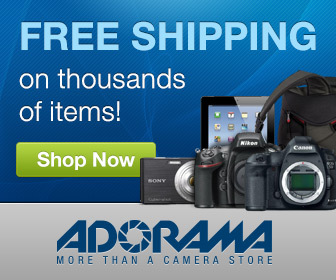 The print is a 6×9″ image printed on 8×10″ Fuji Crystal archival paper. It’s not every day that you publish your first photobook so Matt was there to capture the first pages rolling off the press. All That Life Can Afford by Matt Stuart is now available for pre-order and you’ll want to get your order in for this one! StreetShootr: Your new book is called “All That Life Can Afford”. What’s the significance of the title? SS: What inspired you to make a book of your images? How did the project come to be? Matt Stuart: If I’m honest it is not a project it has been a way of life over the last 20 years. Get up, go out and see what comes my way during the day. I think the book format is by far the most successful way to show photographs, due to its sequencing, privacy, intimacy and tactility. For these reasons I wanted to see my images presented in book form. Sequencing images is always challenging. What guided that process for you? Did the image sequencing affect the meaning of the book as a whole? Sequencing was particularly hard especially as the images are not thematic or story based, they are all individual photographs with the only common link being that they were all made in London. We connected them by lots of different criteria, ranging from colour and weather to death and religion! SS: Is the book self published? Matt Stuart: The book is self published. I have set up my own publishing company ‘Plague Press’ and hope to make more books with other photographers over the next few years. SS: Can you tell me a little bit about the production process? How did the project change from initial idea to the final book? Matt Stuart: It started with me turning up to Stuarts’ office with 46 photos that I definitely wanted to make a book from. Stuart kindly sent me back (again!) to look through everything I had ever done and to come back with at least 200 more photos. I did that twice, eventually we narrowed the edit down to 100, then to 80. SS: Has creating the book changed the way you look at your own images? Matt Stuart: Yes, I learnt a great deal about editing images and photography in general. Things that spring to mind are how some images are connecting images, whereas others stand alone. How some photographs don’t fit even if you want them to, and to turn up with a lot of images to whittle down, the more the merrier at the beginning! SS: Is there one lesson you learned from the process of creating the book? Matt Stuart: Have good CMYK conversions, and someone who knows the printer you are working with. If it wasn’t for Stuart & Claudia (Stuart’s assistant) I expect I would have a very flatly printed book! SS: When is the book available and how can people order a copy? Matt Stuart: The book is due for release on the 1st February 2016. You can pre-order it through my website http://www.mattstuart.com/book. I will be organising book signings/launches in the UK & the USA over the next month, which I will publicise on social media. There are two versions of the book available for pre-orders and one includes a limited edition print. Can you tell me about that? Which image(s) and how it’s printed etc? The limited edition book has a different cover and is signed and stamped. 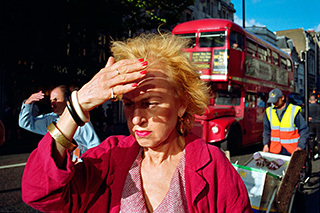 It comes with a signed and stamped print of one of my favorite photographs in the book (Oxford Street 2009). It is in a limited edition of 100. SS: Are signed copies available? Matt Stuart: The limited edition books are signed, although of course I am happy to sign regular editions as well. Matt’s book can be pre-ordered on his website and is expected to be released in February 2016. At the time of writing this post there were still a few copies of the limited edition available so it might be a good time for an after Xmas treat! 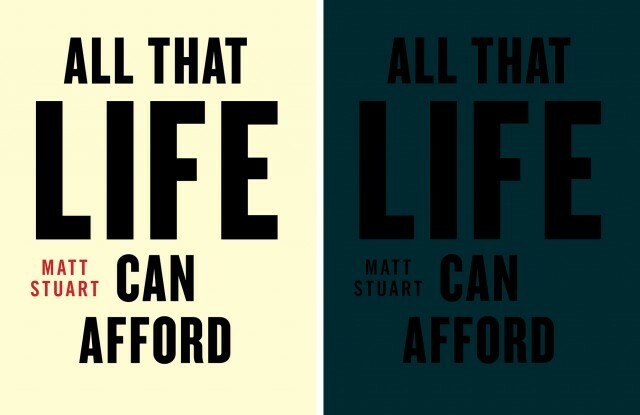 Pre-Order All That Life Can Afford by Matt Stuart. I’m a big fan of Matt Stuart’s work and it’s great to see his first book roll off the presses. 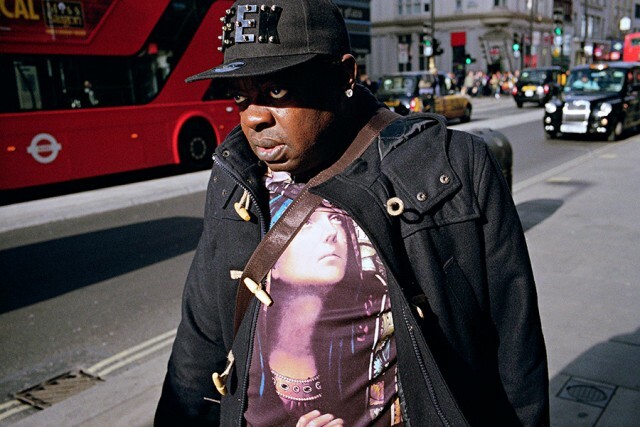 Matt is a tireless street photography advocate and it’s great to hear that he’s set up his own publishing company to work with other street photographers in the near future. This really feels like the start of something good! The limited edition of All That Life Can Afford by Matt Stuart is nearly 3 times the price of the standard edition but photobooks are becoming a solid investment so it’s hard to imagine that this one won’t increase in value. But even if you just grab the plain old regular version you’re getting a volume of work that you’ll enjoy for many years to come. What’s your take on All That Life Can Afford by Matt Stuart? Happy to finally see a full volume of Matt’s work? Or are there other photobooks on your radar? Post your ideas in the comments below and keep the conversation going!